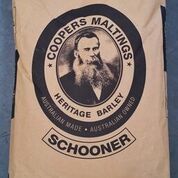 Grown under contract specifically for the Coopers Maltings, Schooner is a heritage barley variety well suited for craft brewing. Schooner's lower attenuation allows for better control in the brewhouse. It's rich, flavourful character provides a solid backbone for hoppy ales and is also well suited for dark and English style beers.